A few weeks ago we ran a brainhack hackathon at Scinet's snazzy HQ up in the 11th floor of the MARS discovery centre, downtown Toronto. The event was organized by open science champions Dr. Erin Dickie, Dr. Sean Hill, and colleagues at CAMH; with help from (amongst others) myself (John Griffiths) and Drs. Derek Beaton and Pradeep Raamana from the Rotman. As we (>50 attendees from >12 different organizations) sat down with our breakfast plates and morning coffee to hear the first few 'ignite' talks by Sean Hill and Jean Chen and discuss what to work on for the next two days, thousands of like-minded scientists, clinicians, software developers, tech industry professionals, and artists around the world simultaneously (give or take time zone differences) sat down at their own local events and started hacking. I don't want go into too much detail here on what brainhacks are all about or why they've taken the (primarily neuroimaging, thus far...) science world by storm the way they have over the past few years, because plenty has been written about this already. To learn more about such things, you can check out the brainhack global website; the slack group, look on the twit for hashtags such as #bhg18, and of course just do some Googling. What I thought would be more useful and interesting is to rather say a few words about the Toronto experience specifically: the kinds of projects, research areas, and community organization that tend to feature prominently. 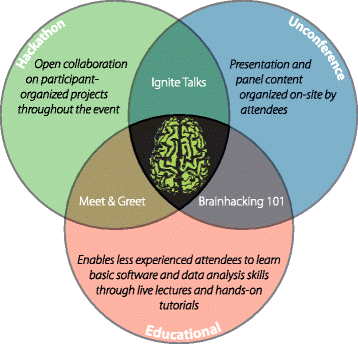 In short, the purpose of brainhacks is to help people collaborate (locally, and also 'virtually' with people at other sites) on both new and established projects ( -> 'hackathon' ); to learn new technical skills ( -> 'educational'); and to communicate with people in their field(s), by hearing about people's research, general questions, miscellaneous interesting ideas, etc. ( -> 'unconference' ). Also I would like to highlight perhaps the most important intersection in this figure ( -> 'meet and greet'). More on that below. Ok so let's talk about Toronto. The first thing to be aware of is that the majority of neuroimaging research in Toronto happens at several large hospital-based research institutes: Baycrest Hospital (Rotman Research Institute); Centre for Addiction and Mental Health (CAMH); Hospital for Sick Children (Sick Kids), Sunnybrook Hospital, Toronto Western Hospital (Krembil Neuroscience Centre); Toronto Rehab; and several others. A lot of research is also done in several departments of the major universities (UofT; Ryerson; York), and there is a lot of interaction between the hospital institutes and the universities, who also house and administer most of the students and many senior scientists. One noticeable feature of this setup, which is no doubt very common, but perhaps more acute than it could be in Toronto, is that people don't talk to each other much outside of their own institutes and/or departments. Of course this is understandable as a day-to-day practicality; but it can result in the somewhat absurd situation that an individual can spend years having zero interaction with extremely smart people [often world experts in their own field(s)], who are working in another institute literally 10 minutes down the road. So my first and strongest endorsement of brainhack Toronto events is that they are the most effective antidote that I have found so far to this unfortunate intellectual siloing. An interesting extension of this, that may or may not be particular to Toronto, is that in addition to the primary contingent of academic and clinical scientists, we are fortunate to have a solid representation from the neurotechnology industry. This comes both from Toronto-based companies ( e.g. InterAxon, Avertus, and Smartstones, all of whom produce consumer-grade EEG systems for a variety of applications), as well as from the Toronto chapter of the international neurotech umbrella organization NeurotechX. So, as with the non-communicative research institutes described above, the melting pot of skills and ideas that is Brainhack Toronto turns out to be an excellent forum for exchange between academic scientists and professional software developers and data scientists from the private sector. This point was further underscored by InterAxon head honcho Graeme Moffat's excellent and information-packed ignite talk about careers in neurotechnology, where he emphasized a) the rapid growth of the neurotech sector over the past 5 years, and b) how research training from e.g. a cognitive neuroscience PhD (particularly the kind of scientific computing skills nurtured at brainhack type events) are highly sought after by employers in this sector. Here are two case studies that demonstrate the Toronto brainhack neurotech sector melting pot in action. Firstly: one of last year's 'brainhack babies', neurodoro, is an android app (available on Google Play), built by Dano Morrison of Avertus, together with colleagues from several other Toronto companies. Neurodoro combines a 'pomodoro' timer for 'work efficiency maximization' with brain state tracking using consumer EEG devices such as the Interaxon MUSE. Both neurodoro and its sister app EEG 101 are available on Google play. Following on from this with case study #2: this year one of the more notable projects at brainhack was EEG-notebooks - a suite of cognitive psychology-based EEG experiments and associated software, that is specifically designed for consumer-grade devices, and is oriented towards neuroscience education. EEG-notebooks is based on and extends Alexandre Barachant & Hubert Banville's excellent work with the MUSE-lsl library. It is also (amongst other things) now serving as the development space for a collaboration between two concurrently running, innovative high school education initiatives - neuroBRITE in Toronto (run by us at the Rotman), and Brainwaves in New York. We did a lot of useful piloting for EEG-notebooks at this year's brainhack; so at any given time one could look around and see two or three people in the room wearing a portable EEG headset, staring intently at pictures of cats and dogs on a screen, or eyes-closed, channelling their chi. Moving on: a major topic at Toronto and most brainhacks is structural and functional neuroimaging analysis. We had two excellent ignite talks from Emma Duerden from Sick Kids (on data mining for neuroimaging) and Dr. Jean Chen from Baycrest (on 'what does resting fmri actually tell us'). Last year's hack gave rise to, and/or gave a major boost to, several excellent neuroimaging software libraries - including ciftify (cifti conversion tools), ConWhAt (connectome-based white matter atlases), neuropredict (user-friendly machine learning prediction and classification for neuroimaging), and MARINeR (multivariate analysis in R). New projects this year included stroke lesion segmentation, partial least squares correlation in python, and visual quality control. Finally: another major topic on the Toronto scene these days is neuroinformatics. "Neuroinformatics is a research field concerned with the organization of neuroscience data by the application of computational models and analytical tools. These areas of research are important for the integration and analysis of increasingly large-volume, high-dimensional, and fine-grain experimental data." This comes up in the Toronto context for a few reasons. One is the large number of people involved, one way or another, with the various activities of the Ontario Brain Institute (OBI). The Rotman's very own Stephen Strother (last year's brainhack speaker and co-chair) is something of a figurehead for these kind of big-data neuroimaging neuroinformatics initiatives, and Stephen's super-smart stats-wiz post-doc Derek Beaton gave a fascinating impromptu unconference talk on multivariate outlier detection for neuroimaging and big data. Another (soon-to-be) major axis of these initiatives is the new Krembil Centre for Neuroinformatics (KCNI) at CAMH. The KCNI's inaugural director Sean Hill's ignite talk covered both his earlier cellular-scale neuroinformatics work with the Human and Blue Brain projects (H/BBP), and looking forward how they plan to extend this hyper-systematic approach to fully integrated healthcare + research operations in area of mental health. Very exciting stuff. Apart from data organization and data analytics, the second part of the neuroinformatics definition above is use of computational models; i.e. computational neuroscience. This is a topic close to the hearts of many of us here in the McIntosh lab who use The Virtual Brain platform for mathematical modelling and simulation of large-scale neurodynamics, Comp neuro forms another distinct flavour in the Toronto brainhack mix, and this seems likely to expand considerably in the coming years. Sean's ignite talk contained several stunning examples of detailed simulations of a cortical column from his earlier work with HBP & BBP. One of the projects I organized and undertook during the brainhack was a team effort from all members of the Lefebvre (sync) lab on implementing a thalamocortical neural field model of EEG rhythms in python. Note: a nice feature of the code in this repo is that the Binder link in this repository allows the code to be 'launched', executed , and explored interactively from any web browser. 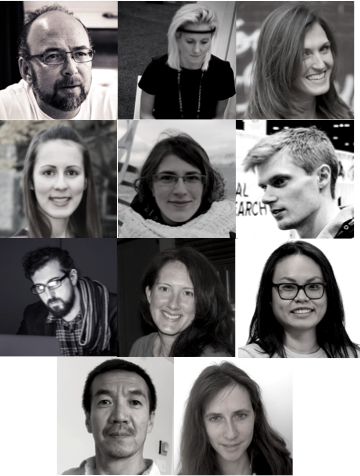 Ok - apologies to the many wonderful people and projects at this year's brainhack TO that I didn't have space to cover in detail. I hope this goes some way to demystifying the brainhack concept, and showing how a bit what the brainhack groove is like in Toronto :).